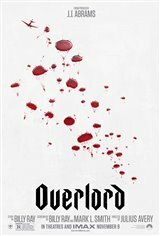 On the night before D-Day, a group of American paratroopers, including Private Boyce (Jovan Adepo) and explosives expert Ford (Wyatt Russell) are tasked with destroying a German radio tower at the top of a church in France so American planes can supply air support to the invasion. But as they approach their target, they begin to realize there is more going on in this Nazi-occupied village than a simple military operation. They discover the Nazis have developed a special serum to bring the dead back to life. Picking up dead soldiers off the side of the road, or kidnapping and murdering the local townsfolk, the S.S. has turned the villagers of an occupied town into deadly monsters in an effort to create super soldiers.